CG PET 2019 : Admit Card Released!! Download Here. 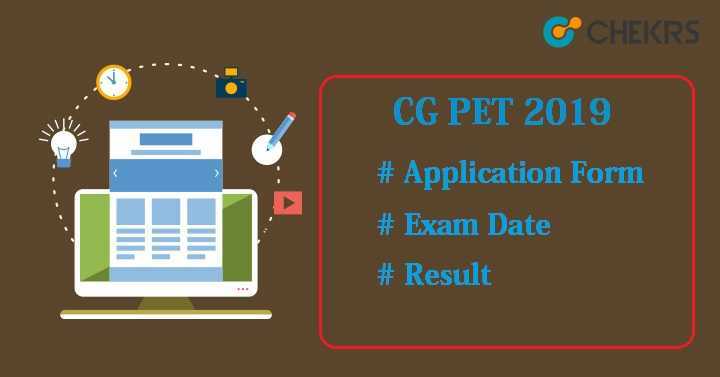 CG PET 2019: Chhattisgarh Pre-engineering Entrance Test (CG PET) 2019 is an entrance examination held at state level for admission in engineering courses. This examination is organized by Chhattisgarh Professional Examination Board (CPEB). CG PET’s other name is CG Vyapam PET. Latest Update: CG PET/PPT 2019 admit card issued!! Download Your Admit Card Here. Latest Update: CG PET Registration Last Date is 7th April 2019. Fill the form ASAP. Latest Update: CG PET Notification Released! Registration is already started on 19th March. This exam is held once a year for candidates wishing to get admission in various streams of engineering course. CG PET will be conducted online. The official authority of CPEB will commence the notification for the CG Vyapam PET Examination in the month of March. To appear in this exam, candidates have to apply online. Check all the important information related to CP PET 2019 Examination here. 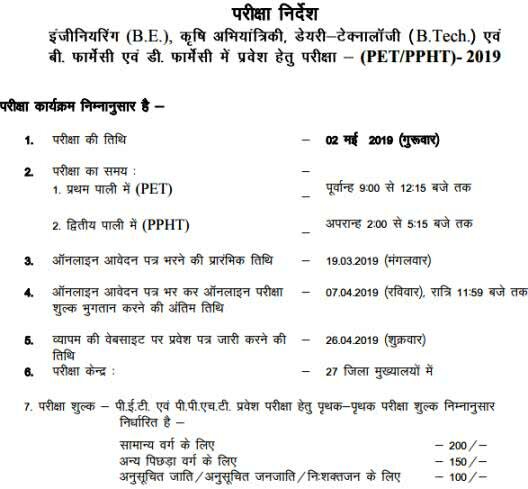 Given below are the important dates of CG Vyapam PET 2019. We have provided the expected dates here; update later after the release of official notifications. Candidates desiring to attend Chhattisgarh Pre-Engineering entrance examination should first examine the CG PET 2019 Eligibility Criteria. Candidates who meet the criteria will be considered for examination only. If the applicants fail to meet eligibility criteria, their seat or admission will be canceled. Only Indian Citizen can apply for this exam. Candidates should have domicile of Chhattisgarh. Maximum age should not be more than 30 years. Applicants must have passed from any recognized board or Chhattisgarh Board. General candidates must have scored 45% in 10+2. For SC/ST/ PwD/ OBC there will be relaxation of 5%. Students should have subjects PCM/ PCB with one technical vocational subject in 12th. Candidates who have passed with grace marks will be considered for the exam. CPEB will release the Chhattisgarh PET Application Form in the month of March. It will be available online. Applicants can get it from the official site of CPEB. Visit the Official site of CBEP i.e. cgvyapam.choice.gov.in. Check the link for “CG PET Application Form 2019” in the Important Information panel. Click on it and Online Application Form for PET page will be open on the screen. First read the instructions carefully before filling the form. There will be question, are you a citizen of India. If you select yes, then form will be open. After this, select for the exam applied and then fill the form according to the required details like candidates name, DOB, address, mobile no, mail id etc. Upload photos, signature & left thumb impression. Proceed for the online payment. Pay the application fee through payment gateway like Credit card/ Debit card / Net Banking. After successful transaction, Payment ID will be generated and send to your mobile no or on mail id. Note Down it for future use. All questions will be objective type. Exam will be held in two shifts. 1st shift will be in morning and 2nd in afternoon. For each correct answer 1 mark will be allotted. CG PET Syllabus 2019 will include various topics from subjects like Physics, Chemistry and Mathematics/ Biology. Candidates can make their study plan according to the prescribed syllabus. Each subjects carry equal marks in the examination. The official authority of CPEB will release the CG Vyapam Admit Card 2019 on its portal. Candidate can get their admit card through online mode only. Candidates must bring admit card while appearing for the exam. Without admit card no one will be allowed to enter into the examination hall. Go to the official site of CPEB. Go to the Admit Card Panel available there. Click on Entrance Exam option. Redirect to next page. Click on the option Entrance Admit Card 2019. Click on the link “Download Admit Card of Pre-engineering Test Entrance Examination 2019”. It will move to next page, where you have to enter your registration Id & code given there and then click on submit button. Chhattisgarh PET Hall Ticket will be open on the screen. Chhattisgarh PET Answer Key will be published by the examination head controller of CPEB. It will be uploaded on the official site. Candidates will be able to download it from there. Candidates can also claim or object for the wrong answer till the given date. After objection, final answer key will be released. Visit the site of CPEB. Search for PET 2019 Answer Key in the Important Information & Click on it. Or go to the Modal Answer Key, select entrance examination. Select PET 2019 Answer Key (पी.ई.टी परीक्षा- 2019 के माडल उत्तर). Answer Key will be open on the screen. Candidates can match their answers with the released answer key. CPEB will announce the result after conducting the examination successfully. CG PET Results will be available on the official site of CPEB. Here we have provided the steps for how to download the CG PET Results. CPEB official portal will be open. Go to the Result Panel present on the site. Select & Click the Entrance Examination. It will redirect to next page. Again select option entrance results of 2019. Now select PET Entrance Examination Results 2019. Enter your PET 2019 Examination Roll no and then click on the submit button. Result will appear on your screen. Save it for your future use. CG Vyapam PET Cutoff will be set by the official authority of CPEB. It will vary every year. Cutoff will be the minimum marks required to get admission into engineering programmes offered by government & private engineering colleges. After result announcement, next process is counselling. CG Vyapam PET Counselling will be started from the second week of June. Candidates who wish to take admission into various government & private engineering colleges of Chhattisgarh can register themselves for the CG PET Seat Allotment.